Clean the turkey breast of all fat and tough tissue. Slice turkey breast into long thin strips. Set aside. Combine all other ingredients in a large zip top bag to make marinade; mix well. Add turkey breast strips and mix again. Place zip top bag in a bowl and place in the refrigerator for 12 to 24 hours. When ready to cook to the turkey jerky, set the temperature on your smoker to 180° and preheat with lid closed for 15 minutes. Drain the marinade and place the turkey strips directly on the grill grate. Let turkey smoke for 4 hours or until the jerky is dry but still pliable. 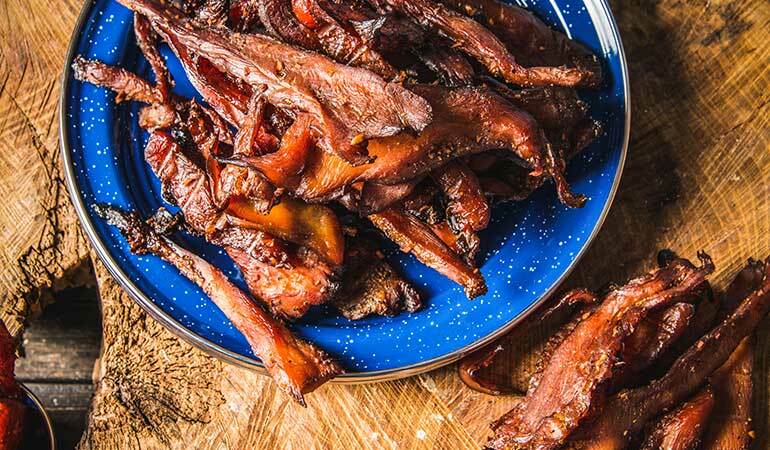 Remove turkey jerky from the grill and enjoy immediately or let it air dry over night before storing. Enjoy!